For those Israeli-firsters out there seeking a memento of Monday’s U.S. Embassy move to Jerusalem coinciding with the state of Israel’s 70th anniversary of the land grab of Palestine, Uncle Donny has the perfect gift for you. Israeli Mikdash Educational Center announced Donald Trump’s face will be featured on an Israeli coin (or a “Temple Coin”) that depicts the US President side-by-side with the biblical King Cyrus, who allowed the Jews to return from exile to Jerusalem 2,500 years ago, and also allowed them to rebuild the Jewish Temple. “President Trump is starting a prophetic process by moving the American Embassy to Jerusalem. Just like King Cyrus 2,500 years ago said: ‘he charged me to build a house in Jerusalem’, here again, President Trump is building a house in Jerusalem,” the Rabbi Mordechai Persoff of Mikdash said in a statement. 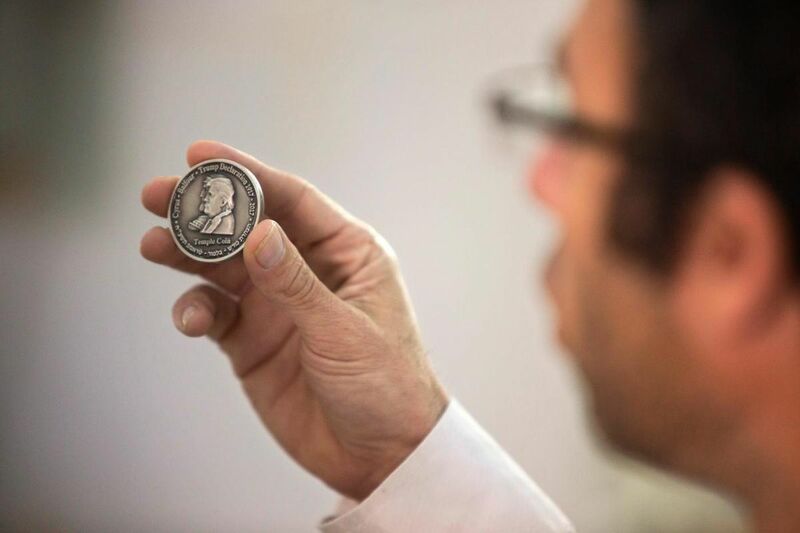 The seal of the United States government is also featured on the face of the Jewish “Temple Coin,” which is overtly based on the Jewish religion and has Torah verses written in Hebrew above the seal of the United States government. On the back of the “Temple Coin” is a dove, holding an olive branch in its beak above a temple. For a just a measly $70, you could purchase a gold-plated coin with Donald Trump’s face on it. The “Temple Coin” has no monetary value but “The Don” puts value on everything puts his “brand” on, in the same way a dog urinates on a fire hydrant to mark his territory. UN Ambassor Nikki Haley recieved a special coin as gift too. Today is day 18 of the 30 day campaign known as Operation Black-Balled! I will write an article every day until June, to advertise my gofundme goal. Please consider supporting me on PayPal https://www.paypal.me/RollieQuaid, sending me sources or atleast advertising my work. I want to buy a computer to produce better articles, and do a Friday show on YouTube live.Visit me at www.rolliequaid.com. Next Post Jew on Jew Bigotry: What Do You Think of Arsim?